It was thursday night, we just got home. Fintan was sitting on the ceramic throne, I was chatting to him, standing in front of him holding and bouncing my belly as I grew accustomed to do lately. It took me a couple of seconds to realise what it could have been once discarded the early incontinence option. “Fintan I think my water just broke…” and then had to explain to him what that meant as he was a bottle of Cabernet down. He started masking his nervousness mixed with cluelessness by repeating “Biba relax and keep on breathing”. Then he jumped in the shower and scrubbed his filthy hands covered in glue from his day of work for what it seemed like an eternity. Since we are still living on a semi-building site, waiting for our new bedroom to be completed on the ground floor, my nesting mode only found its expression in cooking rather than cleaning: our house currently resembles a refugee camp and our freezer Iceland supermarket. When Fintan came out of the shower, like a pair of domestically challenged students, we were trying to rationalise what needed doing, and a very scattered cleaning spree begun. We cleaned the kitchen, the floors, tidy up all the shelves, got rid of all the clothes and stuff lying around…. We covered bed and the recently put together ‘birthing sofa’ – that Fintan built as a plan B in case our bedroom wasnt moved downstairs on time (ahem..)- with plastic sheets which, luckily, we had the foresight to purchase for the occasion. I had heard from a few mothers that their first baby was born within 45min from breaking the waters…so I decided to force myself and Fintan to check out a couple of you tube videos on what to do in case we were to give birth by ourselves especially when baby has the umbilical cord wrapped around her head like we knew ours had. Fintan had made himself a chamomile tea in the meantime, perhaps to counterbalance the ethanol in him. After we watched the first gruesome video, we stared into each other’s eyes and said “let’s just go to bed”. It must have been past midnight by then. Somehow the night went by. I didn’t sleep much and when I did a dream took me to a hospital where some nurses were doping my doctor… The morning arrived in the usual fashion for Fintan, with his ritual cup of coffee. But I bet this time it tasted different. Clouded with the preoccupations of getting the work day dealt somehow, by delegating, prioritising, keeping calm and breathing! My mind was blank. I just had no idea what to do with myself. I called the doctor Sonia who was on her way to see me. Had a shower. Shall I eat or not eat? Throughout the pregnancy I avoided over-informing myself on pregnancy and delivery topics, opting to receive instead my very own birthing experience as it presented itself. So why change a habit? Instead I started reading about the Israeli/Palestine conflict online. Naturally. Waiting for my friend Ashley to turn up as summoned by Fintan. Eventually Sonia arrived too. Not alone. She carried with her a white free range corn-fed hen. Alive. In a sack with her neck sticking out and her little face sensing her destiny. 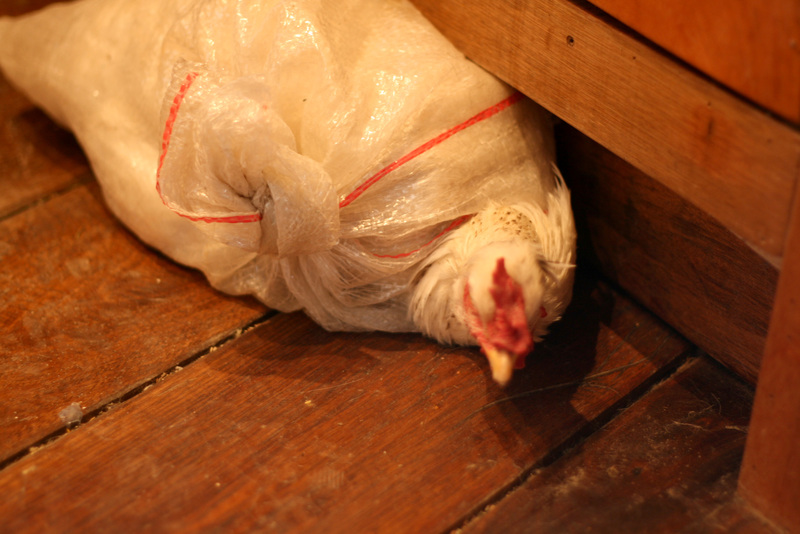 Her fate lied in the Ecuadorian tradition that sees in free range, corn-fed hen soup the miracle of postpartum recovery and breast milk production. 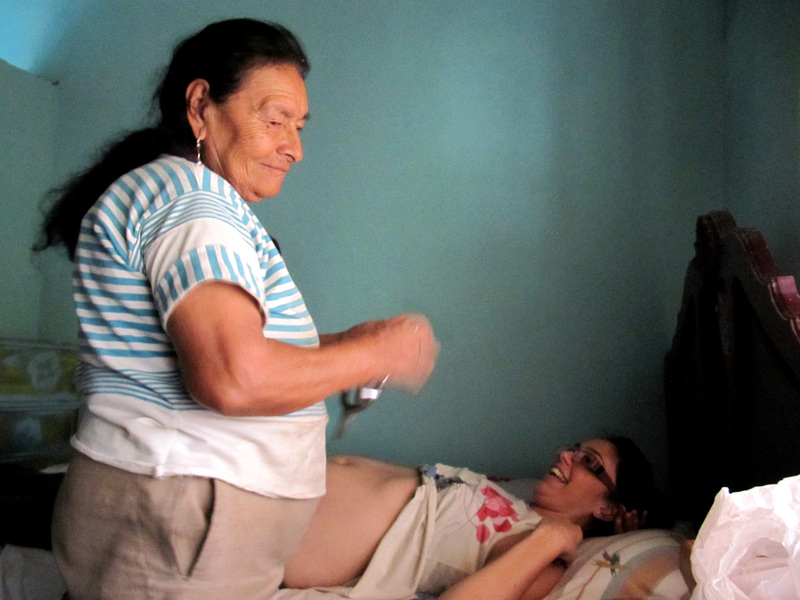 A whole day and evening of contractions kept me walking around the house until Doña Julia, the midwife who we also employed to attend the birth arrived. 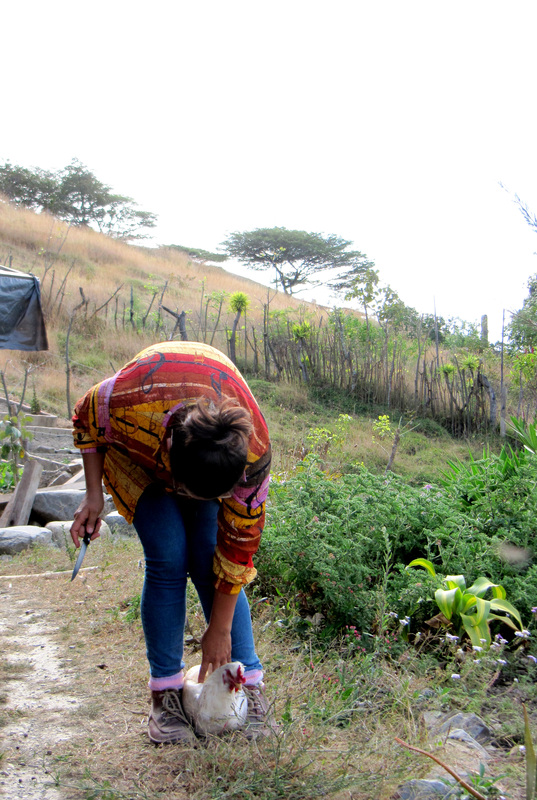 Choosing a home birth in Vilcabamba is quite common practice amongst the foreigners. Seeing the majority of them are all die-hard hippies and full-on against hospitals and pharmaceuticals spiritual people, is not surprising. The locals on the other hand, who have most probably all been born at home, have now embraced medicine as the Holy Saviour, they pop pills instead of using plants as they used to and venerate doctors as opposed to granma-wisdom advices. 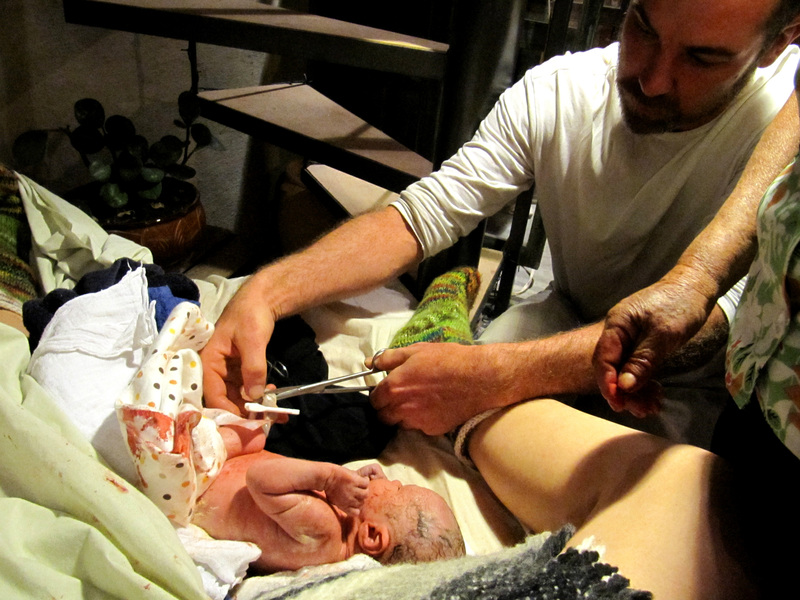 They now all look down on home-births, deeming it a dangerous practice. For this reason there aren’t many midwives to choose from. Some hippy/confident foreigners who have attended some births, enough to advertise themselves as professional midwives, an old local midwife… one really expensive obstetrician who lives 4hrs away…Given this scenario, I had to employ my intuition and just choose who felt right. Someone who we had some sort of affinity with, enough to welcome in the sacred moment of the delivery of our first baby. Sonia and Doña Julia, we found were complementary to each other. Sonia, a 38 years old trained surgeon, gp and friend, had the medical knowledge and some experience in delivering babies that was reassuring to us, and Doña Julia is a 75 years old mama, who has been attending births since 1981, has 12 children herself and has that kind of unquestionable knowledge but not necessarily a clinical approach as we know it. Somewhat unnerving when her instructions weren’t fully backed up by a rational explanation… She had a sparkling fame both among locals and foreigners who had employed her. Both would describe her as an ‘old-school partera’ (= midwife). To me she was like a granma, a caring, loving old lady whose passion for delivering babies glows in her eyes whenever she recalls past births she had attended. This partnership was perfect for Fintan and I but was evident as the night unfolded that it wasn’t an ideal marriage for them. Sonia inspected her hands and asked her to wash them before examining me. Doña Julia said she had already washed them…at home!! She clearly didn’t like to be patronised by young Doctor Sonia. Doña Julia, on the other hand, was rolling her eyes at Sonia, as she was proving her professionalism by listening to the baby heartbeat with her fancy doppler instrument, and noting on her piece of paper the length of my contractions, my temperature, blood pressure and heartbeats. It was fun to watch. Two different generations, worlds apart, armed with cockiness of their respective methods involved in the same cause: the birth of our child. After 20 hrs of bearable contractions, zero dilatation and baby still cosy up high in my belly I was really tired and couldn’t care less about what approach to take. I just wanted to hold my baby. Doña Julia is a master at manipulating babies. She’s quite renown for it. She has an amazing sixth sense when she sets her hands on a pregnant belly. She knows where the baby is and she openly despises the ultrasound technology. No need for it, she says. I can tell from your pulse. But if you asked her to elaborate on that and explain how, she has that very Ecuadorian way of answering but not answering your question. Hadn’t Doña Julia turn up when she did and manipulated my baby in launch position, I would have probably had to be taken to hospital for a c-section for we were approaching 24hrs from the rupture of my membranes with no baby head to be seen. Once baby got channelled in her exit run, the heavy part of my labour begun, by then, all I wanted to do is sleep. Fintan was sitting behind me holding me. He kept on whispering to my ear “don’t forget to breathe”. At the same time I had Doña Julia telling me to keep my mouth closed (don’t let the wind go in, she’d say. Again, when asked her what she meant another placebo answer was given. So out of frustration and at the peak of the contraction I would shout at Fintan ” STOP F***ING TELLING ME TO BREATHE!! ” and then apologize, almost as I had developed Tourette’s syndrome through labour. The pain was indescribable. I finally felt the baby’s head being pushed out and before I knew it the whole body was born. I felt like an animal. I felt like I was high on drugs. Suddenly got a chill and started trembling. Exhaustion stole this precious moment from me. I was barely able to rise a little and look over the bend of my legs to see a little sweet human being lying vulnerable at my feet. I thought it tiny considering the size of my belly. I asked why she wasn’t crying. I told Fintan “no more babies” before encourage him to cut the cord. When I was trying to articulate in my mind that pain I just went through, I realised I wasn’t able. It is true then, mothers forget the pain after giving birth! I thought to myself. I know it was the most excruciating pain I have ever endured but I could not exactly describe what it was like. I can only tell it was the very first time I had a tangible experience of how amazing our bodies are and how miraculous and magic Nature is. Eventually the baby got given to me. It was a pleasure to see how gracefully her chromosomes had combined. I was enveloped in a cloud of love and jazz music and could barely believe what had just happened. 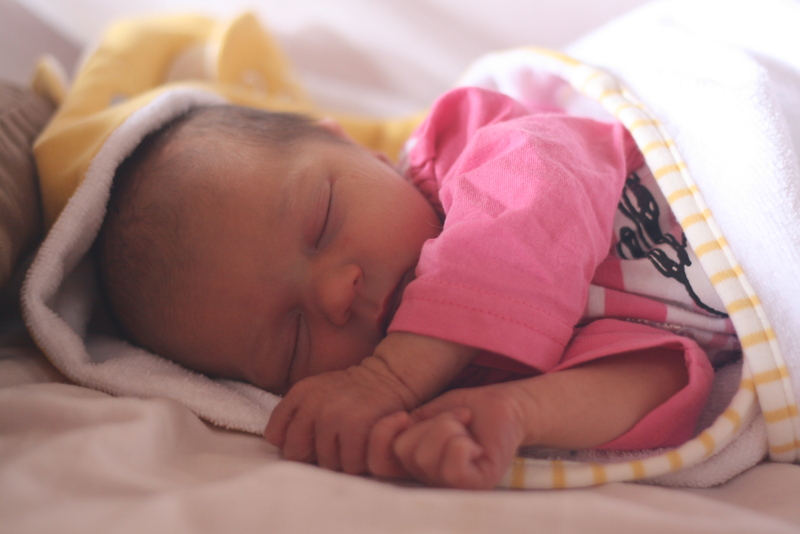 It was 3am on Saturday 26th July when the magic occurred, when my body turned into a sacred portal through which Camila Matilde entered this realm, I entered motherhood, Fintan fatherhood. 03 Aug	This entry was published on August 3, 2014 at 3:34 pm and is filed under Uncategorized. Bookmark the permalink. Follow any comments here with the RSS feed for this post. I LOVED reading this story. Thank you for sharing your birth process. I am glad to read that all went well and you had chicken soup- it’s best to replenish you and the baby. Thanks Lisa!it has been the most amazing experience of my life!